The surface of the heart is lined with three main arteries embedded in the heart that branch off into numerous smaller blood vessels. When an artery or vessel is blocked, surgeons reroute blood flow into another vessel and past suture replacement to detour the blockage. This procedure is called coronary artery bypass grafting or CABG. Symptoms of blockage that might require CABG include chest pain, pressure and shortness of breath. For women, symptoms can be more subtle. Women with heart disease have reported a sense of bloating, general abdominal discomfort, acid indigestion, unusual fatigue or difficulty sleeping. At the Montefiore Einstein Center for Heart and Vascular Care, the mortality rate for coronary artery bypass surgery is less than 1 percent-well below the national average. 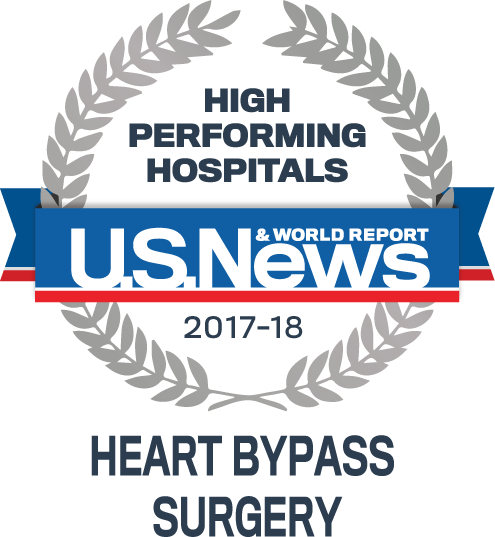 Every year, half of the more than 1,000 bypass operations performed at the Heart and Vascular Center are complex heart surgeries that include a second procedure, such as valve repair. Transferring heart and lung function to a heart-lung bypass machine during CABG can increase inflammatory response and the risk of kidney dysfunction in some patients. For such high-risk patients, eliminating these side effects by performing an off-pump bypass can improve outcomes. The Heart and Vascular Center has refined off-pump bypass surgery for selected patients. A patient undergoing coronary artery bypass surgery is wheeled into the operating room and put to sleep by an anesthesiologist who specializes in cardiac patients. When the heart-lung bypass machine is used, the surgeon will transition to it at this point. Patients are given a temporary blood thinner to prevent clots, then a tube is placed in the aorta and the right atrium. The deoxygenated blood collected in the right atrium is routed to the heart-lung machine where carbon dioxide is removed and oxygen is added. Then the oxygenated blood is pumped back into the aorta where it is distributed to the rest of the body. At this point, the surgeon will turn off the ventilator and stop the heart with an injection of a high potassium electrolyte solution. When the bypass is performed off-pump, the surgeon places a rubber, hourglass-shaped tube inside the vessel that funnels blood through the narrow middle. This allows the surgeon to bypass the artery around the tube while the heart continues to beat. For most bypass surgeries, the surgeon is able to use the mammary artery-an artery that is already connected to the aorta and has been clinically proven to remain open longer than other veins. In cases of multiple bypass, the surgeon will also harvest a vein from the leg using two small incisions and a scope beneath the skin in a minimally invasive procedure. With the patient's angiogram as a guide, the surgeon examines the problem blood vessels on the heart before cutting into them. Using a suture that is half the size of a human hair, the surgeon sews the unblocked end of the coronary artery to either the mammary artery or a segment of vein harvested from the leg. This vein is routed around the blockage and connected directly to the aorta, restoring blood flow. When the operation is complete, the surgeon will restore natural blood flow to the patient's heart and the heart will resume beating on its own. The surgeon will disconnect the heart-lung bypass machine only after the heart has resumed a strong beat. What Other Therapies are Available? For patients and families facing bypass surgery, the prospect of invasive heart surgery prompts inquiry into alternative therapies. The Heart and Vascular Center surgeons help patients understand which treatments are likely to help them live the longest, symptom-free life.